Too many co-incidents happening. First when I started reading a lot about mythology, I came across Devdutt's Shikhandi. Then Blogadda came up with 7 Secrets of Goddess. That one, had a chapter about Gods from various parts of the world. Majorly, Greek one. That made me curious to dig more into the subject. 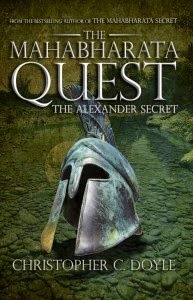 And just when I started doing that, Blogadda came up with this (although fiction) one, The Mahabharata Quest : The Alexander Secret. Written by Christopher C Doyle, this thriller is based on the events ranging from 334 BC to present day. Interestingly weaving in the secret of Mahabharata into Greek legends of Zeus and Alexander. I immediately jumped in for this book. (As till now, reading a hefty amount of myths made me want to escape to fiction once again). And Doyle didn't disappoint me as I expected it to be an engaging affair. After a mysterious prologue, the story starts with an excavation site at Greece. Continuing the team from previous adventure, Vijay, Radha, Alice, Colin and Imran gets tangled in yet another secret. A secret they couldn't think can be connected in this way. A secret that has twists and revelations. (Though I have the previous book lying on my shelf, I don't think reading this book directly will harm. Nothing connected between the two except some sentences referencing to previous book). The research of Doyle shows at many parts of the book. Despite of being a fiction, it holds a lot of authentic and honest amount of writing that makes you awestruck. The route of Alexander during his march towards Indus, the ongoings in Greek politics and even the detailed description of viruses, bacterias, organisms and even DNA and RNA. So authentic it is and not written just for the sake of it. Though the fact is, the medical description made me lose the attention, distracting from the flow of the story, of course it was needed to be there. As mythological-fiction is becoming one of my favorite genre by the time, this one is definitely has that intriguing plot. Making you think what lies ahead for the team. For reserved Vijay, for courageous Radha and supportive Alice and Colin. Making you curious about how the riddles get solved one by one. The writing style of Doyle is compelling. It holds your attention most of the time without deviating to silly details, dialogues or monologues. And again, I would like to mention, the research and timing how each chapter from past is placed. Right incident at right time. No 'flashback' kinda chapter for events of past, and not even overdone now-and-then pieces of past. Just perfect balance. And by the time you reach towards climax, you yourself get into search mode. I actually started Google-ing things which one of the character did in the story. The unusual backdrop for the climax adds more effectiveness. All in all, this is a really commendable effort by author Christopher C Doyle. The Mahabharata Quest needs to be read for the stunning amount of research went into it. Smooth connecting links between Greek and Indian myths. And the thrills ! Go for it. Ajay-Atul's Tharki Chokro is as functional as a Rajasthani track can be. With all the deja vu, it still works well with catchy title loop. While childish Nanga Punga Dost makes an interesting listen with its violins. Lovely short violin tune repeats thru the track making it stuck in head sound. What is more interesting about these two songs is its lyrics. Getting our curiosity higher for the storyline. Next set of songs are nice change from regular set of singers these days. Shaan's Chaar Kadam with Shreya is that typical-Moitra-Love-ballad-template. And I am not complaining there. Next is Sonu with Shreya. Making a fun duet in Love is a waste of time. Reminding of Pal Pal (Lage Raho...) though. Amitabh Varma's mushy words with a twist makes it more fun. But Sonu's next disappoints. Bhagwan hai kahan re tu is rather an ordinary, strictly situational track. Similarly, PK Dance theme. Lastly Dil Darbadar by Ankit Tiwari - feels totally out of place. No where it contains the theme of rest of the album. Barring two tracks and despite template-ized sounds, PK works well in the borders of the movie. PK will work more effectively after watching the movie perhaps. PK Music review, shantanu moitra, ajay, atul, aamir khan, ankit tiwari, rajkumar hirani, alien aamir.